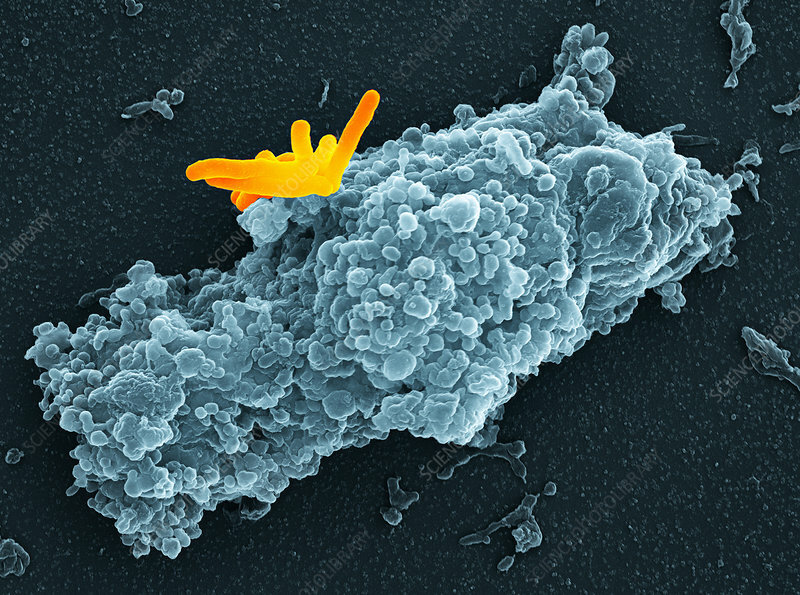 Macrophage engulfing bacteria. Coloured scanning electron micrograph (SEM) of a macrophage white blood cell (blue) engulfing Mycobacterium tuberculosis bacteria (yellow). This process is called phagocytosis. Macrophages are cells of the body's immune system. They phagocytose and destroy pathogens, dead cells and cellular debris. M. tuberculosis causes the disease tuberculosis. It infects the lungs, creating primary tubercles, nodular lesions of dead tissue and bacteria. The bacteria may enter the blood or lymph systems and spread to other organs of the body.